gentlytiptoe: ...just what am I doing? 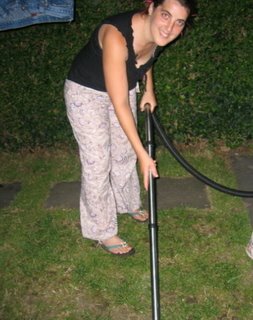 yes, it is as it appears, I am vacuuming my lawn in the dark. 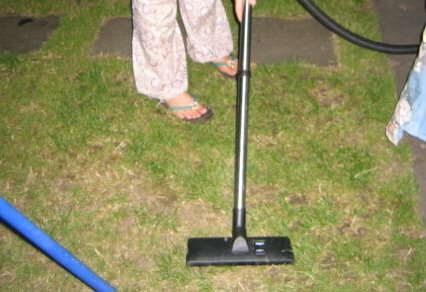 Half ten at night, and there i am with my trusty henry hoovering my rather sad looking grass. why? because (several hours earlier) I knocked a glass off the table after tea, and this was my first opportunity to come out and pick up the (literal) pieces. I did begin with a brush and dustpan, but the light was fading rapidly and I kept having to use my fingers and it hurt. My neighbour looked over the hedge, wondering what I was doing, and jokingly remarked I should use the vac...well I thought it was a good idea. And I think it worked, I could hear bits being sucked up, although I will have to check it out in the morning before any little bare feet venture out again. ok so the neighbours on the one side know what you doing, but on the other side they cleary think your mad!!! Yeah, if I was going to hoover my lawn I'd do it after dark too! Wow good idea, I would have never thunk it!